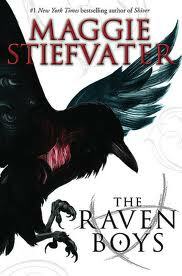 I really, really liked The Raven Boys, by Maggie Steifvater (Scholasitc, YA, Sept. 2012). I'm cheerfully assuming that anyone reading this has already read reviews and summaries; since I don't feel like doing one myself, I'm skipping straight to my personal reaction as a fan of character-driven fantasy. And boy, did The Raven Boys please me with its brightly sharp-edged cast of central characters, who are (like so many people) complicated, uncertain, variously lovable and not so much so. Blue is the daughter of small town Virginia psychics, living in house of women's magic. The four Raven boys are students at the ultra posh prep school that sits uneasily in town, each boy with his own complex back story. The tangled-ness of self and other, the uneasy negotiations of loyalty and friendship, and the sense of precipices of hurt waiting to happen, combined with the fact that the majority of them are lovable, was enthralling. These characters drive the story. Sure, there's a plot with people racing around on a quest of great magical antiquity, and yes, there is a mystery, and supernatural-nesses, and a strong sense of place, and all that was good, but I felt at some level that it was there so that the characters could exist. Although I enjoyed the gradual em-piling of magic upon reality (and it was fascinating, interesting magic), that part of the story seemed to give the characters room to create themselves, rather than dictating their actions in external, quest-related, terms. Which is to say--the interpersonal relationships (which are by no means romance focused, although that's there) come first in reading primacy, followed by the actions involved in achieving the object of the quest. Which is just fine with me. I didn't quite love The Raven Boys, because I was too anxious about people getting hurt. It isn't a safe and cozy book, and I generally choose comfort reads over wrenching ones. However, and this is a new thing, I am distressed to find that when I am confronted with vulnerable teenaged boys, I react as a mother (although my oldest son is still not quite 13....). I fought it hard while reading this--asking myself which of the boys I'd have a crush on, and that sort of thing--but it was no use. I felt maternal and wanted to hug them. So utterly annoying. Just for the record: out of Maggie Steifvater's books to date, this is only the second one that I really liked. The first being Ballad, which is lovely (here's my review), and which I highly recommend even to those who haven't read the (less personally appealing) first book, Lament. I couldn't finish The Scorpio Races, because it was too anxious, and the Wolves series just didn't interest me. Sounds like me viz her other stuff--do consider Ballad! I agree very much - you cover many of the same points as my review. I liked the atmosphere of dread and knowing that something is going to go terribly wrong, but then I don't have a son. And I definitely wanted to give the boys a big, comforting hug. I wasn't going to read this as I haven't connected with any of Stiefvater's other novels. BUT. Now I might. I think I will wait until the whole series is out though. I'm really looking forward to The Raven Boys, but your review makes me think maybe I'll let it wait till the whole series is finished before I pick it up. The Scorpio Races was one of my favorites for the year . . . would it help you pick it up again if I promise it ends well? Well, I might try again...maybe when I'm in a really cheerful mood! Might I suggest listening to The Scorpio Races as an audiobook? I thoroughly enjoyed listening to it, and I believe it either won an award or received an honor... (rushes to double check review)... Honors for both Printz and Odyssey Awards. An audiobook might be the way to go--less viscerally immersive than reading! Viz waiting until the series is done--I don't think this is one that really needs waiting. The first book doesn't finish off everything, of course, but it is solid in and of itself. It's not at all cliff-hangery in a desperate way.